Providing leading edge training programs that deliver increases in service levels and grow your sales. Are your store managers and sales team members delivering a high level of customer service each and every day? Are they providing more than a transaction? Are they solution providers or just order takers? 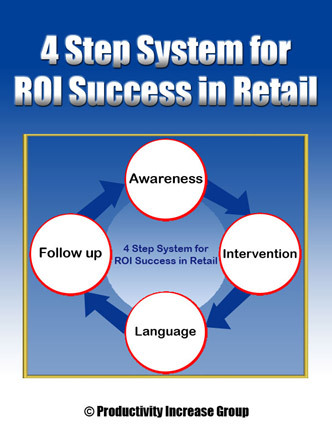 And are these interactions resulting in an increase in your key KPI’s such as average sale and items per customer? Continuously developing your team’s customer service and sales skills is the key to building and maintaining a high performance business which is essential in today’s ultra-competitive retail landscape. An investment in these skills is essential if you want your team members to maximise every interaction with your valued customers. Awareness is the first step we teach and this is done poorly by most managers – they are unaware of their team members actual behaviours with customers – why? They don’t look at the detail. Awareness is observing what is going on, but it is based on watching what their staff members are doing with customers – are they smiling, greeting, talking about special offers, farewelling customers? Are they doing this consistently or only now and again? Managers have got to build a picture of each staff members overall performance (against the set standards) so they know where each staff member is at. They can’t just rely on customer feedback and mystery shoppers – the small number of times they receive this information is not enough to have a thorough understanding of where each staff member is at. Intervention is essential because without intervention, staff will not change their behaviour, therefore no improvement will take place. In dealing with staff performance there is no other way but to build awareness (by observing) and intervene by providing feedback. Once an owner/manager has become aware and knows where their frontline staff is performing they now need to intervene. Language in our experience is one of the main reasons why Managers don’t provide feedback to their staff as they don’t know how to do it effectively. They may have tried a number of different ways but their staff still end up being defensive and offering excuses. Many hurdles stand in the way of giving effective feedback, the two main ones that we see are a lack of time and not knowing the right words to use. The language that we teach owners/managers to use when giving feedback is direct, specific (deals in the facts) and can be delivered in 10 – 15 seconds. Follow up is essential if you want to maintain a high level of performance with your team. If Managers build awareness and intervene using the right language most staff members will improve their performance (or maintain their high level). Unfortunately, this is not the magic formula that ensures your staff stays at this high level forever. They need ongoing follow-up to stay there. Follow up requires Managers to be continually aware of how each staff member is going and then intervening on a regular basis. Staff members are human beings, they slip back into bad habits from time to time, so, ongoing follow-up is required to keep them at this high level. Call our office now on 1300 950 301 to Contact Us about taking your service and sales to the next level.